Graduate students accounted for nearly 40 percent of all University of Toledo graduates during the spring 2016 commencement exercises, and UT officials have identified the leader who will continue to elevate the institution’s graduate programs. 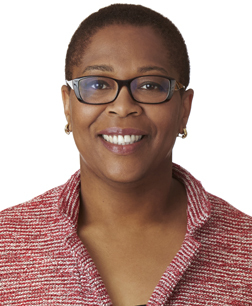 Dr. Amanda Bryant-Friedrich will serve as dean of the College of Graduate Studies beginning July 1, pending approval by the UT Board of Trustees, following the retirement of Dr. Patsy Komuniecki. Barrett’s sentiment was echoed by Bryant-Friedrich, who plans to focus on increasing UT’s graduate student enrollment and its undergraduate to graduate student retention. She said she would look to increase the number of pipeline programs, which enable students to earn undergraduate and graduate degrees at UT more rapidly. Growing philanthropic support for the college also will be a priority. Calling UT’s graduate programs jewels, she said she plans to work with faculty, alumni, and Marketing and Communications to better spread the word about the University. She also spoke about the need to ensure programs are reinventing themselves to meet the needs of the changing world. “I know from experience that personal interaction has a big impact when it comes to graduate student recruitment,” she said. UT President Sharon L. Gaber praised Bryant-Friedrich’s work on behalf of graduate education as part of the Strategic Enrollment Planning process. “Dr. Bryant-Friedrich has the energy and enthusiasm to build the strength of our graduate programs and ensure students know of the endless possibilities available to them with a UT education,” Gaber said. Bryant-Friedrich, an associate professor in the Department of Medicinal and Biological Chemistry in the College of Pharmacy and Pharmaceutical Sciences, added that incoming Provost Andrew Hsu has encouraged her to attain full professorship in the coming years, which aligns well with her goals and plans. “I am looking forward to working with Dr. Bryant-Friedrich to strengthen and promote the outstanding graduate programs at The University of Toledo,” Hsu said. After Memorial Day weekend, The University of Toledo Ritter Planetarium is opening the doors to its newly renovated Brooks Observatory for Mars Watch 2016. 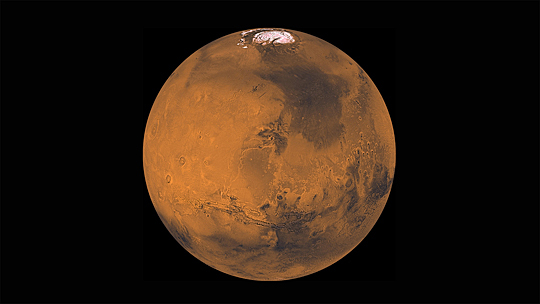 The public is invited from 9:30 to 10:30 p.m. Tuesday, Wednesday and Thursday, May 31-June 2, to view the Red Planet through the UT telescope as Mars marks its closest approach to Earth in more than a decade. The public is invited to view Mars, seen here in this image from NASA, at UT’s Brooks Observatory Tuesday through Thursday, May 31-June 2. The free event is dependent on clear skies. Visitors are invited to meet in the lobby of McMaster Hall, where they will be guided up to Brooks Observatory. The somewhat ticklish, exfoliating feel of toes in the sand is one of the joys of a Great Lakes summer escape. 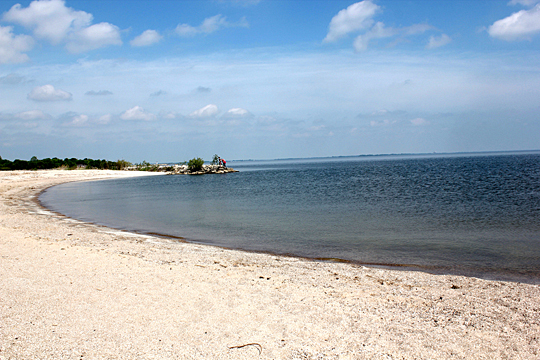 To preserve the beauty and health of a northwest Ohio shoreline frequently visited by families, The University of Toledo Lake Erie Center is inviting the public to help pick up litter on Maumee Bay State Park’s public beach Friday, June 3, at 4 p.m. in Oregon. The cleanup is in partnership with the Alliance for the Great Lakes, which holds more than a dozen Adopt-a-Beach events throughout the region each year sponsored by Barefoot Wine and Bubbly. Last year, nearly 15,000 Adopt-a-Beach volunteers — enough to fill 207 school buses — removed 37,581 pounds of trash at 348 locations in Illinois, Indiana, Michigan, New York, Ohio and Wisconsin. For more information or to register online, visit greatlakesadopt.org. Passing board certifications can be a daunting experience for any new physician, but psychiatry and neurology residents can rest assured they are in good hands. Dr. Noor Pirzada, professor of neurology and the neurology residency program director at The University of Toledo, has been named vice chair of the American Board of Psychiatry and Neurology, which oversees the certification exam for all psychiatrists and neurologists in the United States. The American Board of Psychiatry and Neurology is under the American Board of Medical Specialties, the largest physician-led specialty certification organization in the country. Because it is tasked with administering the board certification exams for all neurology and psychiatry residents in the nation, the board has an immense impact on those professions. Pirzada has been involved with the American Board of Psychiatry and Neurology for years. For quite some time, the certifying examination was a live exam where the residents saw patients; for eight years, he served as an examiner who would sit in and observe and evaluate those taking the exam. Pirzada also has served on the board of directors for the last seven years. Though he will continue to serve on several committees within the organization, his year as the vice chair will be his last on the board of directors. As vice chair, Pirzada will coordinate all policy meetings, which are an important aspect of the organization because they discuss all issues in regard to certification and maintenance of certification. Pirzada also will assist the board as a liaison to other professional organizations and the Accreditation Council for Graduate Medical Education with financial matters, hiring new directors, and serving on several committees. He said that he’s excited to take on this responsibility and make a real impact on the field. Karen Bauer, wound care nurse practitioner in the Wound Care and Hyperbaric Center at The University of Toledo Medical Center, recently was elected to the Association for the Advancement of Wound Care Board of Directors. She will serve two years as the consumer member. The Association for the Advancement of Wound Care is the leading nonprofit membership group in the United States dedicated to advancing the education, public policy and the application of evidence-based wound care practice. The UT Wound Care and Hyperbaric Center provides specialized treatment to patients who suffer from chronic, non-healing wounds. Customized care plans are created for each patient, addressing underlying medical conditions using a multidisciplinary team approach. “I’m excited to represent University of Toledo Health, collaborate with wound care specialists from across the country, and help to pave the way for better patient care,” Bauer said. 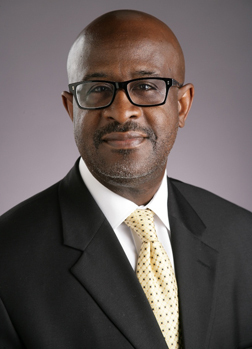 Dr. Willie McKether, who had been serving in a temporary role this spring as special assistant to the president for diversity, has been named vice president for diversity and inclusion, UT President Sharon L. Gaber announced today, pending approval by the UT Board of Trustees. 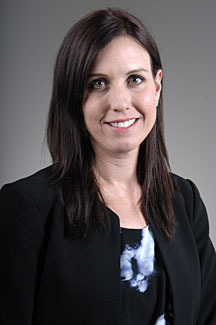 McKether also will hold a vice provost appointment. Since her arrival at The University of Toledo last July, Gaber has been working to promote diversity throughout the culture of the institution. McKether’s professional background and training in cultural anthropology and multicultural retention efforts over the past 10 years have helped provide a world view that will aid him in this new role, Gaber said. Much of the work McKether will take on has been outlined in the draft strategic diversity plan he led the coordination of this spring as special assistant to the president for diversity. Trustees will consider the plan in the months ahead. McKether said he’s also planning to increase UT’s outreach to advocacy groups in the community and ensure there is an ongoing dialogue. In addition to his faculty position in the Department of Sociology and Anthropology, McKether has served as associate dean in the College of Languages, Literature and Social Sciences. He is also a leader in the organization Brothers on the Rise and an advisor to the Black Student Union. He is co-founder and co-director of the Multicultural Emerging Scholars Program, designed to retain students at The University of Toledo. Dr. Shanda Gore will serve as associate vice president of the Catharine S. Eberly Center for Women and the Minority Business Development Center, working across UT to advance these organizations. “Dr. Willie McKether is an inspirational figure in the African-American community. He has a contagious passion for education that has proven to be transformative for young people and especially young men. He possesses the strong moral values needed to inspire young people to believe in themselves and the possibilities for a bright future.” — The Rev. Otis J. Gordon Jr.
One assistant professor at The University of Toledo is a step closer to solving one of the mysteries of the human body with the help of an award and some seed grant money. Dr. Wissam AbouAlaiwi, assistant professor in the UT Department of Pharmacology and Experimental Therapeutics, recently received the New Investigator Award from the American Association for Colleges of Pharmacy. The award, worth $10,000, is given to faculty members in the early stages of their career. 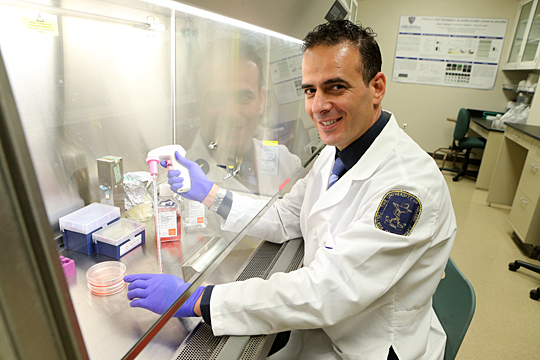 Dr. Wissam AbouAlaiwi performed experiments on cells from mice and humans with polycystic kidney disease to confirm studies performed on patients. The $10,000 will go toward funding his research on primary cilia, organelles that were originally thought to have no function, but that AbouAlaiwi and his colleagues believe play a role in cardiovascular and polycystic kidney diseases. They already have found that when the cilia are not present or not functioning, it can cause cardiovascular and developmental problems in the heart. Though the amount of this particular award is not enough to fully fund his lab’s research, getting some data will open doors for AbouAlaiwi to earn larger grants such as those from the National Institutes of Health. 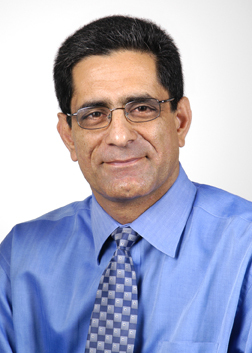 He will present his initial findings at the American Association for Colleges of Pharmacy’s annual meeting in July in Nashville, Tenn.
“This is a small study, but hopefully the data that we will generate will allow us to take this project and confirm our results in animal models and, in the future, humans,” AbouAlaiwi said. UT’s College of Pharmacy and Pharmaceutical Sciences is no stranger to the American Association for Colleges of Pharmacy; each year, a group of deans, faculty, staff and students attend the organization’s annual meeting. AbouAlaiwi also is the second faculty member who has won this award; Dr. Isaac Schiefer, UT assistant professor in the Department of Medicinal and Biological Chemistry, received it in 2014. “It’s very good for our university and college because it raises the level of presence of our university among other top colleges of pharmacy in the United States,” AbouAlaiwi said. AbouAlaiwi gives much of the credit for his success to his college, his department and his students. He said that Dr. Johnnie Early, dean of the College of Pharmacy and Pharmaceutical Sciences, as well as his colleagues, have supported and encouraged him to be active in organizations like the American Association for Colleges of Pharmacy. He runs his lab with his students, whom he shares credit with for this success, saying that the research would not be possible without them. The man who set the Guinness World Record for number of pizzas made in one hour is opening a Domino’s Pizza at the Gateway. Brian Edler owns more than a dozen franchise stores in Ohio, including the Domino’s in Findlay, where he baked and boxed 206 medium cheese pizzas in 60 minutes in December 2010 while raising $37,000 for charity. Three years ago, he also created Domino’s parmesan bread bites that are now on menus nationwide. 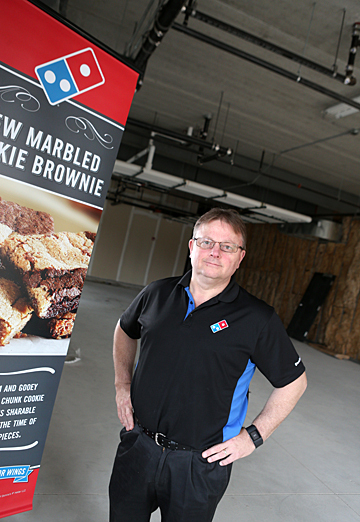 Brian Edler will open a Domino’s Pizza at the Gateway this summer. The restaurant at the Gateway is expected to open its doors in July next to Jimmy John’s at the retail center on the corner of the UT Main Campus at Secor Road and Dorr Street. Edler’s business partner is Brent Medders, another Domino’s franchise owner out of Arkansas. They plan to open 10 stores in the Toledo area in the next three years under their corporation Rocket Pizza. Edler is hiring for the Gateway Domino’s. To apply, go to jobs.dominos.com. Gateway opened three years ago and features restaurants, stores and loft-style apartments. Businesses include Barnes & Noble University Bookstore, Gradkowski’s, Starbucks, Rice Blvd., Verizon Wireless Zone, Huntington Bank, Great Clips, Jimmy John’s and Bubble Tea. As the spring air fills with fragrant lilacs and honeysuckle, like clockwork, new works of art dot the grounds of The University of Toledo. Ready to share a secret, blooms adorn a bench wrapped by a twining vine and heart-shaped leaves near the north entrance of UT Medical Center. A figure leaps skyward toward a sphere on the west side of Savage Arena. 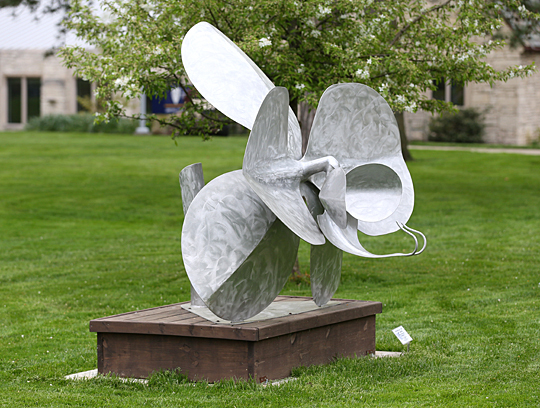 And north of Libbey Hall, a silver flower sparkles as it pays tribute to an acclaimed American artist. 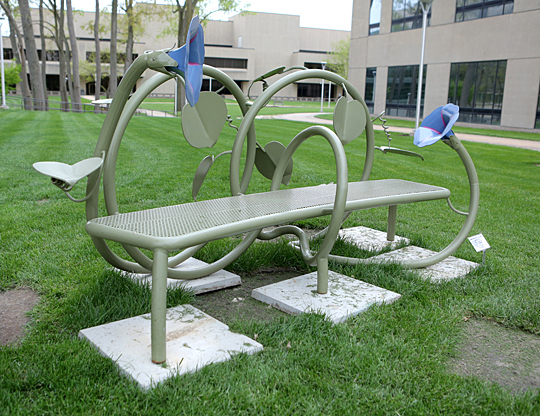 Jim Gallucci’s “Listening Whisper Morning Glory Bench” beckons near the north entrance of UT Medical Center. Jim Gallucci’s “Listening Whisper Morning Glory Bench,” Mike Sohikian’s “Reaching for the Moon” and Douglas Gruizenga’s “Georgia on My Mind” are three of the new works featured in the 11th annual Outdoor Sculpture Exhibition. Gallucci, and artist in Greensboro, N.C., said his benches are whimsical, playful pieces that invite the public to sit and talk. “Good art challenges us, can make us feel righteous, moves us, soothes us, and can bring us peace,” he said. 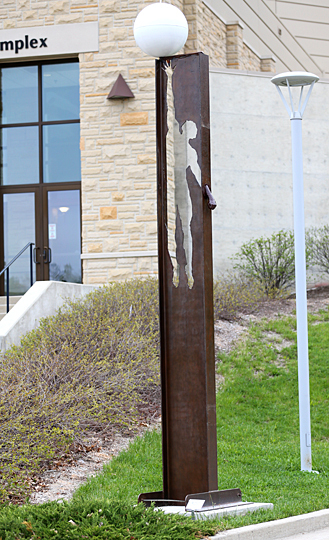 Mike Sohikian’s “Reaching for the Moon” is located on the west side of Savage Arena. A retired ironworker, Sohikian has a reputation for taking salvaged steel to new heights. The Genoa, Ohio, artist assembles and reworks industrial materials into riveting creations. The trio are among more than 50 who submitted proposals for consideration to the Midwest Sculpture Initiative. The UT Campus Beautification Committee reviewed the entries and selected pieces that recently were installed. More than 100 sculptures have rotated through the display at the University since the exhibit began, and 11 have become part of UT’s art collection thanks to the generosity of campus benefactors, colleges and departments, according to LeBlanc. North of Libbey Hall, “Georgia on My Mind” by Douglas Gruizenga honors artist Georgia O’Keeffe. • “Metropolis” is a 250-pound steel geometric piece featuring an eye-catching blue orb. Forged by the Nordin Brothers, the sculpture sits atop the hill west of University Hall. • Todd Kime’s “The Joneses” offers some splashes of color in the center of Centennial Mall. 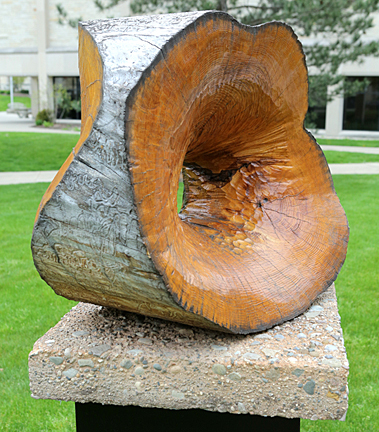 • “Ashes III,” Sam Soet’s intricate slice of ash wood, is located between University Hall and the Student Union. “Ashes III” by Sam Soet sits between University Hall and the Student Union. • The Nordin Brothers weigh in again with “Time Series Calendra,” a hot-rolled steel work located on the west side of the Health and Human Services Building. In addition, three sculptures from last year’s exhibit remain: Virginia Kistler’s 500-pound piece of Extira and steel, “Ad Infinitum,” appears to rotate between Nitschke and Palmer halls; Ric Leichliter’s steel red buds,“Promise to Flower,” sprout on the east side of the Health and Human Services Building; and Tom Rudd’s 9-foot, 1,000-pound “Whitefish” still swims south of Carlson Library near the Ottawa River. Artists receive stipends for the sculptures, which will be on display for the next year. LeBlanc said gifts from donors make the annual exhibition possible. “Those who enjoy the sculptures are asked to consider a donation to the Campus Beautification Committee through the UT Foundation,” he said. Two local bioengineers are officially in the business of back pain relief. A new medical device developed by researchers at The University of Toledo to help reduce infections from spinal surgery is making its market debut. Spinal Balance created Libra, a pre-sterilized, individually packaged screw system designed to combat contamination in the operating room. 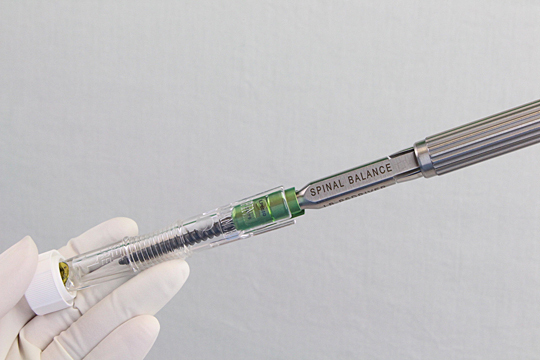 Spinal Balance will celebrate the launch of its first locally grown product called the Libra Pedicle Screw System Wednesday, May 25, at 6 p.m. at the Nitschke Technology Commercialization Complex on UT’s Main Campus. Libra is a pre-sterilized, individually packaged screw system designed to combat contamination in the operating room as a result of contact with people, containers or surfaces. The product will help surgeons at hospitals worldwide improve patient care and reduce costs. The Food and Drug Administration cleared the Libra system last year to be used for spine fusion and to treat back pain in cases of degeneration, trauma and deformity. Agarwal and Dr. Vijay Goel, UT Distinguished University Professor and the McMaster-Gardner Endowed Chair of Orthopedic Bioengineering, launched Spinal Balance in 2013 and developed the Libra technology through support from the state of Ohio’s Third Frontier Program, Rocket Innovations and UT’s LaunchPad Incubation program. The celebration of the Libra product launch will begin with a reception at 6 p.m., followed by presentations at 6:15 p.m. and a dinner at 7:15 p.m.
Spinal Balance is one of three private companies Agarwal has located in the LaunchPad Incubation program with other UT research faculty members. Agarwal’s company called IntelliSenze recently received $150,000 in state funds to help commercialize microprocessor chips under development that can detect the presence of bacteria and viruses.